Hali Lookabaugh, owner of Muse Gallery, stands next to a few pieces currently on display. To muse is to ponder over something; to be a muse, is to be one of the nine art-presiding daughters of Zeus, or one of their inspiring kin. To be the aptly-named Muse Gallery on Hilton Head Island is to be a space where the art conveys, where pondering is advocated, where creative inspiration is never questioned and is enthusiastically encouraged, and where there is no right or wrong time for the conversation to begin. Representing primarily mid-career artists, Muse Gallery Hilton Head specializes in original abstract paintings, works on paper, and sculpture. “Mid-career artists have been producing work for many years and are either nationally or internationally recognized. Most are in major museum and corporate collections, published in notable publications, and exhibit at numerous galleries across the U.S. or in other countries,” Lookabaugh said. 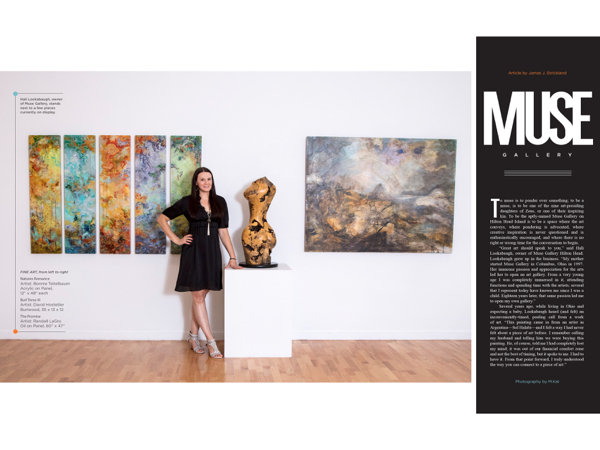 Where most newer galleries take years, often decades, to establish themselves and the artists they represent, Muse Gallery Hilton Head has the advantage of its familial link to Muse Gallery Columbus. Lookabaugh’s gallery has organically evolved from the foundation of works by mid-career artists that she brought with her, as well as artists she has cultivated and built relationships with since opening her Lowcountry gallery. “I’m very particular about the artists I represent” she said. “I have to have a connection to each artist and a true understanding of their work. The curation of it all is a very important aspect, picking specific pieces to show from an artist’s body of work and planning exhibits.” Shows and workshops scheduled throughout the year give Lowcountry residents and visitors the opportunity to meet the artists and view the of works of over 20 artists from all over the country. 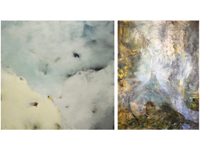 Lookabaugh is particularly pleased to be hosting an opening reception for a two-person show on Thursday, October 26 from 5-8 p.m., featuring Randall LaGro, Taos, New Mexico, and Mel Rea, Cleveland, Ohio. “I have a deep connection with these two artists,” she said. “I am truly amazed by both artists’ ability to engage the audience in the inadvertent stories being told. Their work is inviting, thought-provoking, and mesmerizing.” Both artists will attend the opening.